Do you think of trading as a solo activity? It may be one for a lot of people, but not for everybody. There are a lot of traders who like to partner up with others who use similar techniques to spot the best entries. Team trading is more common with Forex than binary options, but that is probably because the Forex community is more established than the binary options community at this point of time. More and more team trading opportunities are likely to become available in the coming years. Learn from others and experiment with new techniques. Profit from accountability to others. Losses, not only profits, are often shared. Blame and not only losses may also be shared. Scheduling can be a challenge to deal with, especially across time zones. If traders share an account, battles for control may ensue. Not all new friends are trustworthy. Will you be trading on a single shared account, or will you each have your own trading accounts? If you merge funds into a shared account, who owns what percentage of the account? How will you handle withdrawals? Will you lock funds in the account for a certain period of time, or will each team member have the option of taking out his or her percentage at any time? Who will have access to the account? Never share an account unless you completely 100% trust your teammates (both their expertise and their characters). What times of day will you trade? Whether you are all located in one time zone or not, you may have issues with scheduling. What time will you look at the charts together—or will you each look at charts on your own time? How will you alert your teammates about trading opportunities? How will you get around work schedules and sleep schedules? Does it even make sense to trade with the other members of the team, given your schedule and theirs? Before you trade with others find out how to balance your own trading life with your daily life. How closely will you trade with the team? Some team traders do all or most of their trades together. Others may trade more or less independently, sharing their ideas and techniques with the team and learning from others, but ultimately making their own trading decisions. You need to decide how much you are going to let the team influence your trading. How often will you revise your method and test something new? While learning new things is great, it can also be distracting. The key is to let the team help you improve without losing focus. You may want to use a team method to learn about hedging, no touch trades, range trading, and even ladder trades. Who will you blame when things go badly? Ultimately the number one person who is responsible for your losses is always yourself, and it is vital not to lose sight of that fact. Nevertheless, if you identify problem behaviors in other team members, those team members are accountable to you, and you have a right to demand improvement. Likewise, your teammates have a right to demand the best from you, as you are accountable to them. Success or failure is shared, at least in part, and you owe it to your team to make smart trading decisions, not trade emotionally, manage your money (or the team’s money) wisely, and balance trading with the rest of your life. Learn how to recover from big losses before they come your way. When you trade binary options, you need to have a trading plan that spells out when you will trade, what assets you will trade, what system you will follow, how you will manage your money, and how you will manage yourself (trading with discipline). When you trade with a team, the team also needs a trading plan. Lay the ground rules in the beginning, for everyone to see, and work together to make sure that everybody is on the same page. The plan gives you an objective set of guidelines for accountability and performance. 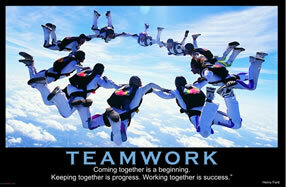 You can also work on integrating the team plan with your own individual plan. If both fit together well, team trading may very well be for you. But if you cannot reconcile the team’s plan with your own, you might be better off flying solo. Does your trading plan include these 10 elements?